Hot dogs and craft beers go together. Who knew? As soon as web editor John Chandler announced he needed a volunteer to attend a beer and hot dog dinner at the Original "Dinerant" last Friday, I stood up in the middle of the room and began clearing my throat loudly. This was an assignment I could sink my teeth into. See, I love hot dogs. And I love beer. Furthermore: You love hot dogs. And you love beer. Conventional wisdom holds that the frankfurter is nothing more than mysterious meat parts stuffed inside a sausage casing. If so, then there was something truly inspired about these wieners. 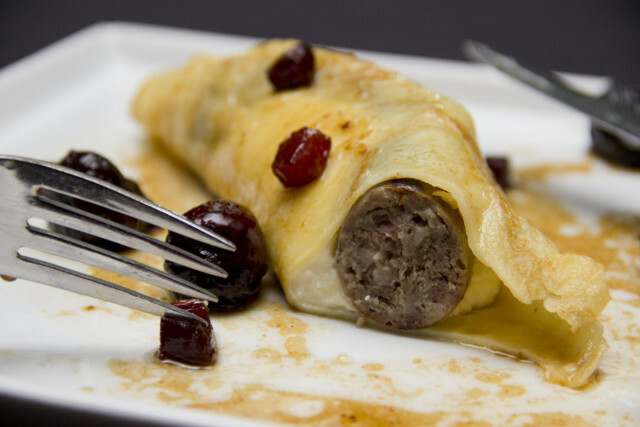 The combination of locally sourced artisan sausage with elevated ideas of originality and innovation is something that you don’t see very often when it comes to hot dogs—but with food costs spiraling into the stratosphere, it’s high time we reassess our methods of production and preparation for this most basic and beloved of American entrees. The goal of this collaborative feast between the Original’s new head chef Ryan Bleibtrey and Fort George Brewery of Astoria was to produce unusual and distinctive summer pairings of Northwest craft beer with our old friend, the humble hot dog, an idea very much in keeping with the Original’s aim of updating comfort food staples. My usual approach to hot dog cookery consists of building a fire, sharpening a stick (followed by making a field bandage out of my sock), slathering the frank with French’s mustard and washing the whole thing down with a lukewarm lager from the folks at Anheuser Busch. Clearly I had much to learn. 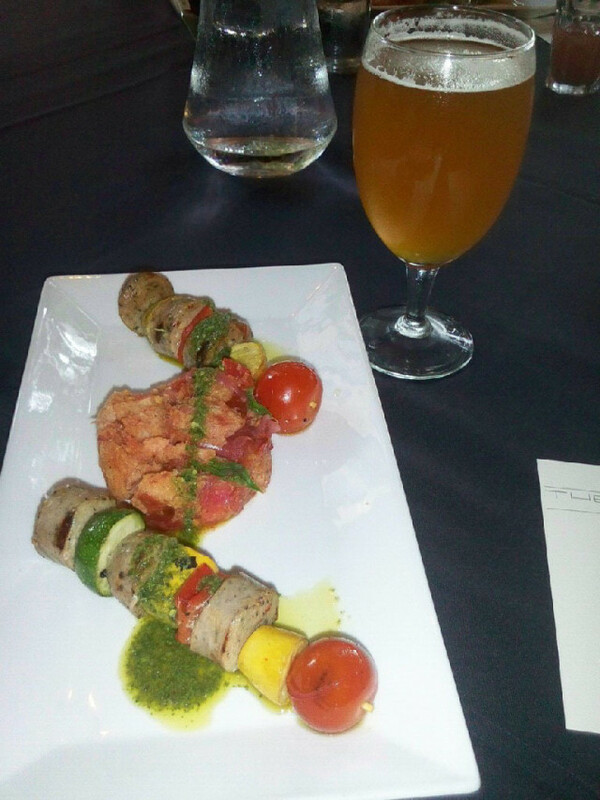 Hotdog shish-kabobs, ratatouille, panzanella, and pesto paired with Sunrise Oatmeal Pale Ale. At first, seeing plates of hot dogs, a food for the commoner and usually consumed with the hands in the outdoors, presented with a knife, fork, and cloth napkin, seemed strange. Out of place, a bit unnecessary. Then it became delicious. The first course was light, cool and definitely as refreshing as a dish containing a hot dog can be. The kabobs were accompanied by Fort George’s Sunrise Oatmeal Pale Ale, a sessionable brew with fresh floral aromas and a subtle creaminess that played nicely with the cool panzanella, seasonal vegetables, and chicken apple sausage of the ratatouille, driving home the point that this was indeed a summer repast. 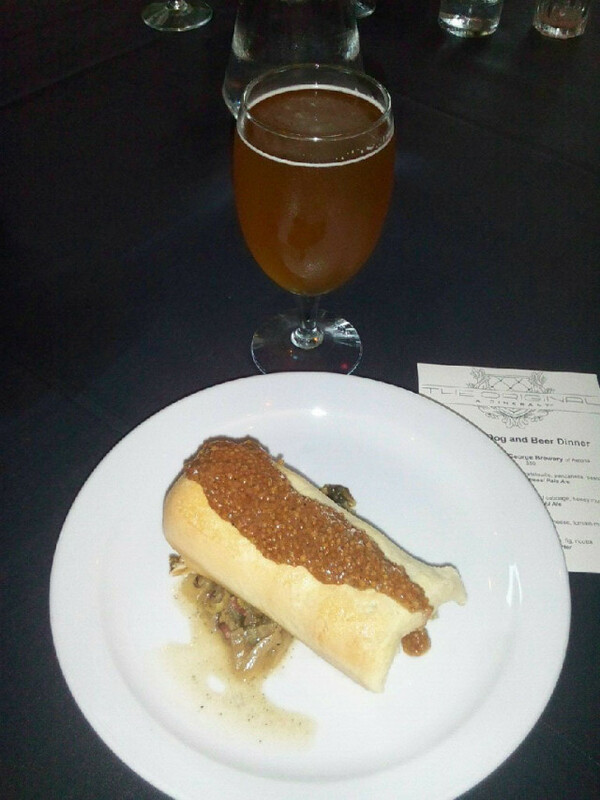 Knackwurst & Bierocks, braised cabbage, honey mustard paired with Fort George Spruce Budd Ale. The crisp, gentle piney flavor of the Spruce Budd Ale was a fitting companion to the hearty pork filled knackwurst & bierrocks. The seasonal Spruce Ale is unique; in the brewing process hand picked Sitka Spruce tips replace hops resulting in citrusy ale with a pine nose. The sweetness of the house-made honey mustard especially contrasted the light tanginess of the lemony aAle. BBQ brisket corn dogs, fried mac n cheese, tomato marmalade paired with an unnamed Double IPA. This was no corn dog I ever had, crunchy corn on the outside with moist, flavorful beef brisket on the inside. By this time there was not much room left in my stomach, but I still devoured every centimeter of the rich beef brisket. My eyes were clouding over, and I felt myself creeping inevitably toward a food and brew coma. It could be because my stomach was approaching capacity but I thought the 10 percent ABV IPA was a bit much for a course of such substantial heft. Maple bacon sausage, figs, ricotta, and bourbon glaze paired with Working Girl Coffee Porter. The Working Girl Porter had a big roasty coffee flavor that felt right at home with the breakfast-y charms of the maple and bacon. The ricotta and bourbon were a welcome inclusion, adding a bit more flavor complexity to this powerhouse dessert dish. As I looked around for a friendly someone to wheel me home on a hand truck, it struck me that my opinion of the hot dog was rapidly evolving—from ubiquitous snack best savored when broke or at a ballpark, to something that could serve as the foundation for some legitimate culinary artistry. At the same time, the appeal of hot dogs and beer is definitely a nostalgic one: sun burns, gulping down questionable lake water, inner tubes, blisters from new flip flops, Coleman grills, the smell of sunscreen, and gathering together with friends and family. It’s a classic paring that is inherently summer, and this meal captured that nostalgia. And the improvements and alterations didn’t diminish the memories one bit.